If you know me or have read my blog before you may know I’m very passionate about self-experimentation. As a scientist, I find published research extremely valuable generally speaking, but when it comes to individual circumstances there’s nothing like testing things on yourself and finding out what works. I had been thinking about getting a DNAFit analysis ever since I heard about this company in podcast land. It wasn’t until recently, when I grabbed a discount code from another podcast, that I finally bought 2 kits: one for me and one for my husband using his birthday as an excuse. The process is simple: order your kit on the DNAFit website, wait until it arrives from the UK, get a sample of your cheek cells in the provided plastic tube, send your kit back and wait patiently for your results. Results come in 3 PDFs: one with the fitness bit, one with the diet bit and a handy infographic with a summary of recommendations, perfect for people who prefer pictures over words. The reports explain in detail which genes are analysed, what is your allele (the combination of bases in that particular gene) and its effect on your body. The results are also available online. These were the things that made me go WTF??!! 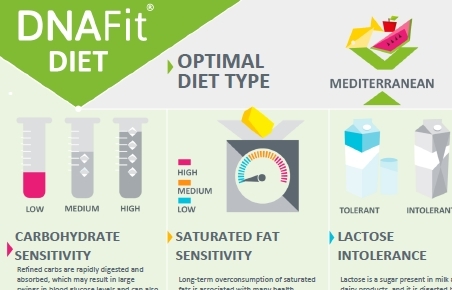 The diet report also comes with tips, recommendations and a suggested optimal diet (either Mediterranean, low carb or low fat), which in our case was Mediterranean. I must say I found this recommendation a bit on the “everything in moderation” camp, but I might be wrong. In summary, we’re both meant to cut down on sat fats, eat more MUFAs and PUFAs (especially omega-3), watch our glycemic load intake (Alvaro more than me), don’t go crazy on the caffeine, get more sunshine, and get more antioxidants. Alvaro also has to up his folate and cruciferous vegetable intake. We have already introduced daily citrus fruit in our diet and I’m aiming to increase our fish intake in lieu of some of the meat. Now, for the million-dollar question: would I recommend getting this analysis? Depends. If you have the money, the curiosity and the intention to implement suggestions, go for it (especially if you can score a discount voucher like I did). Same if it’s important for you to optimise your health and/or performance, for example if you are a professional athlete. Want to learn more? Go to the DNAFit website. cool – loved reading about your experience with DNAFit, I just posted mine & was curious to see what others on here thought of the whole thing! thanks!